Functional meets fancy with the American Metalcraft Glacier blue glass bowl. Serve appetizers and snacks, or hold dressings, salsas and sauces in this stylish bowl made of blue glass. Excellent for food presentation or serving. Functional meets fancy with the American Metalcraft Glacier blue glass bowl. 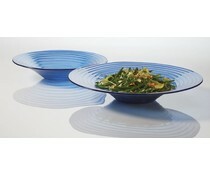 Serve appetizers and snacks, or hold dressings, salsas and sauces in this stylish bowl made of blue glass. Excellent for food presentation.